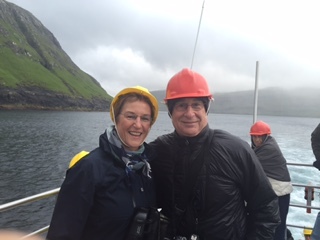 Today we docked in the Faroe Islands. 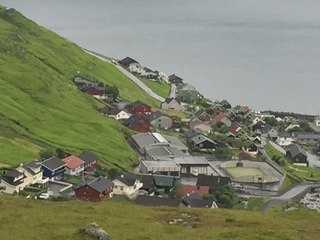 The Faroe Islands are made up of 18 different islands, 17 of which are inhabited. Two of them only have one family living on them. They believe strongly in local education here, so for primary grades, each village has a school. What about those families that live alone on these two islands, you ask? Well, there is a teacher that spends two weeks on one island with those children, then a helicopter transports her to the other island for two weeks. And she goes back and forth all school year. Taxes are 45% here but everything is free, health care, elder care, education, transportation in the bus system, etc. Yes, even those helicopters and the teacher. 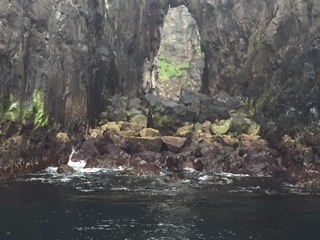 The population of the islands is 48,000 and there are 70,000 sheep. And they wander everywhere. The guide says there is a hefty fine if you hit a sheep with your car, not so if you hit a human! I am sure he is using a little Faroe Island humor with that one. 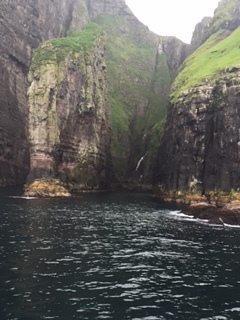 There are very tall cliffs here and one sport is to climb up on the cliffs and hoist a sheep up with a rope. The sheep grazes there for months and then the men climb back up and lower the sheep down. They say the grazing up there makes them taste better, but really the sport of it is what attracts. 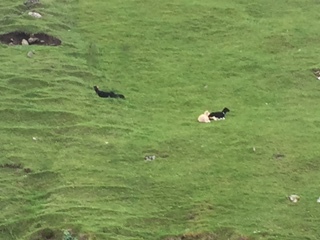 Incidentally, there are no trees on these islands, the sheep have destroyed them all. 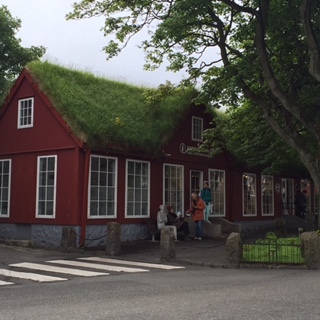 We then explored the capital, Torshavn, which is named after the Norse god Thor. 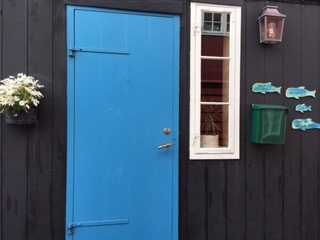 It is one of the world’s smallest capitals. They do kill and eat whales here, and everyone, even a newborn, gets equal shares of the whale meat. It is very windy, and you might think they get a lot of power from wind, but no, only 10% because the wind keeps knocking the windmills down. It is a very safe country – there have been 5 murders and 3 bank robberies in the last 300 years and no one locks their doors. Our guide has only seen a gun twice in his life. 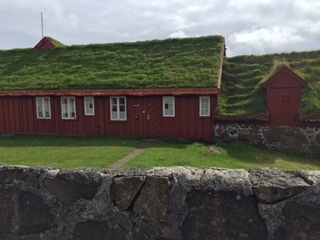 There are wonderful houses with grass growing on the roofs. 95% of the economy here comes from fishing and fish farming. We saw lots of salmon fish farms in the bays, salmon ladders for the wild salmon fishing and lots of fish was being loaded on to our ship. One of my favorite flags!